Standard SharePoint user interfaces are not user-friendly. Third-party web part providers are functionally restricted and largely inflexible. SharePoint projects rarely occur without developers or programmers. Background processes need to be programmed or configured using a workflow engine. New versions of applications need to be rolled out using SharePoint solution files (WSP packages) which enforces a failure of the SharePoint application. Staging in SharePoint generally needs to be performed manually, which is time-consuming and can lead to errors. Connection existing ECM/DMS systems is not possible in SharePoint Standard, and only a poor Outlook connection is available at best. All applications have the same look and feel thanks to a standardised user interface. SharePoint browser-based scanning thanks to loboSPhere scan. No matter if you are using Microsoft SharePoint or SharePoint Online in Office 365, getting your important data from paper and electronic documents into your workflow has never been faster and simpler. SharePoint integration in Outlook and the drag & drop function between Outlook and SharePoint are just two of the many features of the loboSPhere mail module. You also have the options of the automated archiving of emails directly from the exchange server and the SharePoint offline synchronisation. loboSPhere allows display of digital business processes in SharePoint. Easy creation or amendment of processes using a graphic process editor. loboSPhere has a native connection to MS Exchange and CRM. Using loboSPhere, third-party systems can be connected at any time by creating individual process modules. loboSPhere view gives you a powerful viewer with more than 300 different formats. loboSPhere is purely server-based and requires no client installation. With loboSPhere framework for business apps you can introduce standardized and enterprise custom SharePoint business applications in less time and with much less effort. And this WITHOUT programming, WITHOUT creating WSP packages, WITHOUT reset of the IIS. The updates to the business applications take place during operation. Generate documents automatically and integrate your data – flexible, powerful and intuitive. With loboSPhere documents you can generate all kinds of documents including all data sources in various output formats. Configure Charts in minutes for SharePoint Lists (Across Site Collections), Microsoft SQL, Oracle, Business Connectivity Services, Excel (with or without Excel Services), CSV, and Web Part connections as data sources. Drill down into the charts to show more charting or data that the chart is based upon. Charts are configured in minutes and simple enough to be configured by SharePoint users with loboSPhere report. loboSPhere connect allows a standardised view of various archives. At the same time, this module integrates access to your different archive systems through automatic connection of various storage systems. No migration required! You can also easily incorporate your ERP and LOB systems. loboSPhere enhances your SharePoint with DMS standard functions (e.g. Cold, spool data archiving, format conversion) and enables creation of own functions via API. 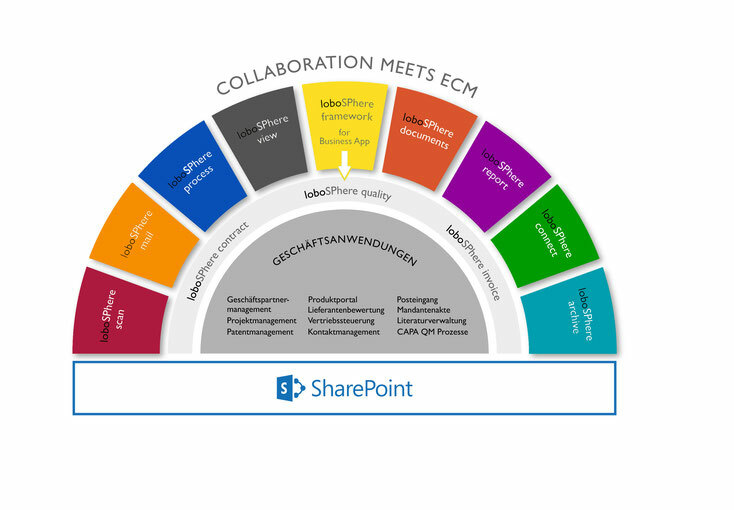 The loboSPhere archive module creates a central ECM platform using your SharePoint. loboSPhere also provides a certified solution for audit-compliant archiving in the usual SharePoint look and feel. A unique feature of this solution is that it can also be used with SharePoint Foundation. To serve you the details, please enter your name and E-Mail in the form below. We will send you the details asap via E-Mail.